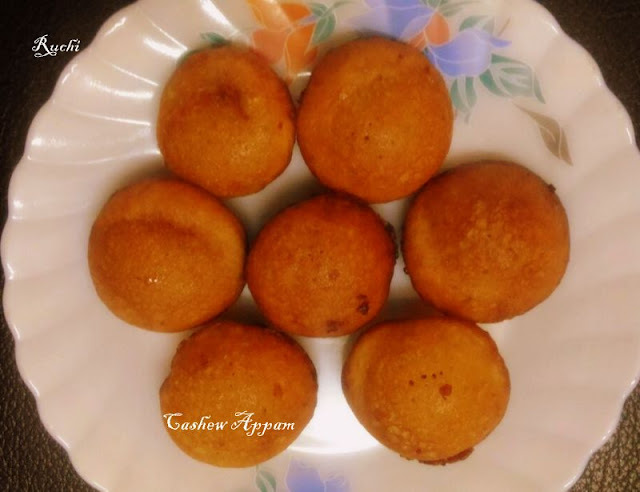 Appam is a sweet prepared during festive seasons. There are many variations making Appam It can be made with Rice flour, wheat flour ,Maida can be made with sugar instead of Jaggery, etc.. For this Navaratri I tried Cashews appam for first time. it s extremely delicious and came out very soft.This exotic sweet dish become very favourite of my family. People who love sweet would love it surely! 1.Soak the Rice and cashew separately in water for 2 hrs and Grind soaked rice and cashew adding little water till soft. 2.Then add the jaggery, coconut, banana, and grind to the consistency of dosa batter.finally add cardamom powder and mix well. 3.Heat the appa kaarai with oil/ghee. Pour one ladleful of the batter in each kuzhi till half.